It is likely that nearly everyone in the United States has heard of the Church of Jesus Christ of Latter-Day Saints, more popularly called “the Mormons.” In the 2012 election, Republican candidate Mitt Romney was a Mormon. Well, he still is. The “was” is for the term of his candidacy, rather than his religious affiliation. Never mind that. The fact is that my mom was always sort of interested in Mormonism. When my mom was a new stay-at-home mom with a young child, she answered the door when two young Mormon missionaries were at the door. She became friends with them, and, though she did not convert, she found a lot to like about Mormonism, particularly their family orientation. She and one of the missionaries stayed in touch with one another for the next ten years or so. So when the time came to plan our 1980 vacation, my mom wanted to go to Nauvoo, Illinois. The Church of Jesus Christ of Latter-Day Saints was founded by a man named Joseph Smith, in Palmyra, New York. He claimed to have found a set of golden plates that had the story of the “lost tribes of Israel” having fled to North America and Jesus having visited them there. Soon after founding his church, Smith and his followers moved to Ohio, then on to settle in Nauvoo, Illinois. While they were living in Nauvoo, Smith and his brother Hyrum were arrested and held in the jail in Carthage, Illinois. While they were incarcerated, they were murdered by an angry mob. 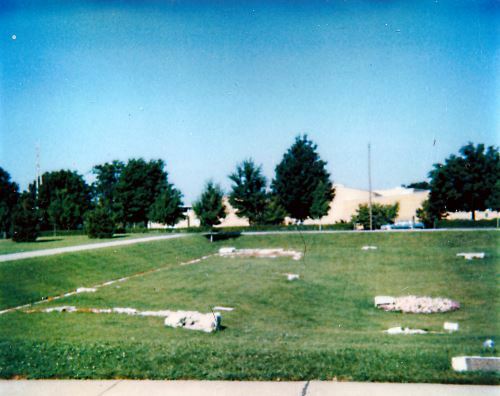 The central part of town, at the time, was the space where the Nauvoo Temple had once stood (the Nauvoo Temple was rebuilt in 2002). We visited a lot of houses, as usual, but the site of the temple really stuck in my head. Human memory is fallible, but I seem to recall that they asked non-Mormons (I was raised United Methodist, though I’m sort of between churches at the moment) not to walk on the ground where the temple had stood, since it was still considered holy. I didn’t find out until later that the Mormons had sold the Temple, and, after the Temple had been damaged in a fire, the purchaser had sold it to someone else. The Mormons purchased the land back in the middle of the 20th century. Maybe they had rededicated it, or whatever it’s called, reconsecrated, maybe? I don’t know. And maybe I’m misremembering and non-Mormons were able to run around freely on that land. Now that there is a new Temple on the site, only Mormons are allowed to go there because of the nature of a Mormon Temple. 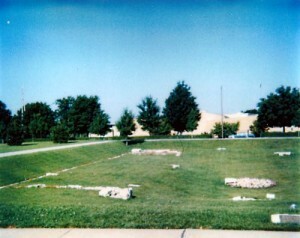 The site of the Nauvoo Temple in 1980. Due to stress between the Mormons and the other residents of the area, soon after the Mormons elected Brigham Young as their new president, they moved on, eventually settling in Salt Lake City, Utah. I have to admit that there are some things about Mormonism that I find appealing. Particularly, I like the health codes. I probably drink more soft drinks than is strictly healthy for me, and I’m a moderate consumer of caffeine (which is forbidden to Mormons) but I already don’t drink alcohol or smoke. I come from a family of alcoholics and my reaction to alcohol is more “Really?” than “Whee!” And the plan is for me to spend more time in a Mormon situation next year — Alex and I will hopefully be flying into Salt Lake City, then driving to Yellowstone for our 2016 vacation.